In addition to the many millions still suffering from acute malnutrition, over one-third of all children in developing countries globally experience chronic malnutrition – often referred to as “hidden hunger” (pdf). Aside from the inherent suffering, the devastating longer-term consequences (both for the child and ultimately for their country) are often not understood. Progress has been made in the fight against malnutrition. The development of highly fortified nutritious pastes, ready-to-use therapeutic foods, together with community-based management has revolutionised our ability to treat severe malnutrition. These products are eaten directly from the pack, do not require mixing with water, are stable without refrigeration and are highly convenient and palatable. Combined with the innovative approach of empowering mothers by delivering nutritional care to people in their communities rather than in hospitals, these foods have resulted in dramatic improvements in treatment and prevention, with death rates cut fivefold. But the problem is too big to leave to the UN, NGOs and the public sector to resolve. There is an opportunity for the private sector to lead in tackling this problem but traditional models that approach the treatment and prevention of malnutrition from the perspective of corporate social responsibility or charity, are not only failing to address the problem, they are also missing major opportunities for revenue growth. Malnutrition can now be treated at real scale. However, in order to extend this approach to include prevention, we need more effective engagement with the corporate sector. The debate shouldn’t be about if, but rather about how, the private sector should engage. We set up our company, Valid Nutrition, as a social enterprise with the specific mission of manufacturing these life saving foods exclusively in developing countries and making them more available, appealing and affordable to those who need them most. Fundamental to our vision and approach is the concept of regarding malnourished people as customers – and not just as passive beneficiaries of goodwill. In our opinion, the reason engagement has moved so slowly is that it has been based too often on a flawed CSR viewpoint. Despite all the hyperbole, CSR tends to be peripheral in most organisations and is not woven into the fabric of the business. It’s not always transparent and there maybe strings attached. Sometimes it’s driven by a need to buy profile and even worse, CSR has been used as a type of moral counterbalance to practices that have had direct negative impacts on the poor. To make a lasting difference, we believe the prevention of malnutrition must be integrated into the core business of major food companies. Realistically, that requires shareholders to receive a tangible return. At some point, companies must be able to generate profit out of their engagement with the so-called “base of the pyramid” (the economically poorest 1 billion people on our planet). Controversial perhaps, but also rooted in realism. So how can we align two such apparently conflicting aims – the prevention and treatment of malnutrition, and profit making? Ultimately, there should be no conflict. The World Bank has identifiedmalnutrition as the single greatest cause of poverty. There is strong evidence that children who receive adequate nutrition go on to have substantially increased earning power as adults [43% more according to a major study published in The Lancet, in 2008]. A lifetime of increased earning power from an initial investment of less than $100 (£66), is a massive return that has huge potential to boost consumer markets and economies. Given the vast numbers of people in this segment of the global population, investment in early child nutrition is highly economically attractive for both governments and industry alike. Reaching those consumers however demands that we create viable business models that establish better mechanisms for engagement between public and private sectors. There are two distinct and complementary models that combine and maximise the comparative advantages of each sector; one designed to increase the efficiency, impact and reach of free or subsidised products, the second, designed to increase the availability, purchase and consumption of beneficial nutritional products by those who can afford them. Both require standards and metrics to guarantee efficacy and protect the food security and self-sufficiency of vulnerable groups. Ingredients must be procured in developing countries in a way that supports local agriculture and avoids the dumping of subsidised farm outputs on the developing world. The first model requires public nutrition interventions targeting the very poor. The low or non-existent purchasing power of these groups means that such products must be free or heavily subsidised, funded by public bodies, manufactured by businesses willing to accept a low margin and targeted to public sector and civil society actors. Although many of the essential elements of this system are already in place, its efficacy and impact needs to be increased by better harnessing private sector capability. We need commercial engagement to expand production, reduce cost and enhance distribution of new appropriately formulated foods. We also need to link these initiatives to public sector nutritional assessment and diagnosis through the use of prescriptions or vouchers. The widespread use of mobile phones, even in the poorest communities, provides an exciting and powerful potential mechanism for related cash transfers to offset against purchase price. The second model requires appropriately formulated consumer food products to be sold to the lower levels of the socio-economic pyramid at affordable prices. Each consumer persuaded to buy effective nutritional snacks, enhances the economic productivity of future generations and frees up vital public resources to focus on those who cannot afford even the simplest foods. To achieve this requires innovation, courage and imagination. Although ultimately the market is attractive, private sector companies entering this space on their own, face high initial risk, especially having to accept diluted margins for a considerable period. Unfortunately, typical shareholder requirements (including from many so-called “impact investors”) preclude this sort of patience and vision. Many companies also fear criticism of their motives in attempting to operate commercially. Business requires encouragement to face challenges. We are convinced that we can demonstrate that suitable commercial models can align revenue generation with social impact. We believe that to open up this market requires a new genre of businesses, free from the short-term demands of typical shareholders. Structured imaginatively to avoid dilution of corporate margins, such businesses could harness commercial sector capability through purchasing R&D and “route to market” expertise and develop suitable brands produced on a commercial basis that penetrate through the population pyramid. Such social businesses, committed to addressing humanitarian need while also achieving a commercial return, are beginning to emerge. By combining an enterprising social vision with a disciplined business approach, many are now punching above their weight and can use their presence to leverage a much wider ethical engagement from other commercial actors. 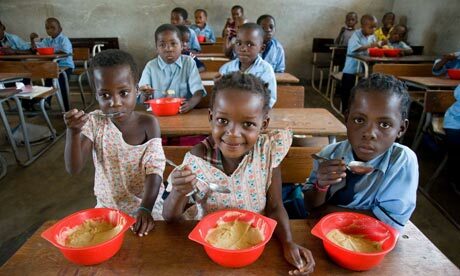 The current model for nutritional development has failed the poor of so many developing nations. Much CSR contributes to this failure through its focus on disbursements that do nothing to harness business capability or add value to the money given. Socially orientated corporate engagement through commercial enterprises can however create a multiplier effect that both improves nutrition and ultimately fosters sustainable economic development. This in turn can stimulate agricultural activity, thereby helping to create a positive cycle that both treats and prevents undernutrition. Such an approach will increase both the social and economic returns of investment. Enabling all children to reach their full potential depends largely on nutrition. By imaginatively broadening the scope of engagement with the private sector, we can make meaningful and sustainable progress and in so doing create a massive beneficial change for individuals, societies and economies. Dr Steve Collins, is a medical doctor, child nutrition expert and chairman of Valid Nutrition. Paul Murphy is Valid Nutrition’s chief executive. Prior to joining the social enterprise, he worked with Unilever in a variety of senior roles for over 27 years. 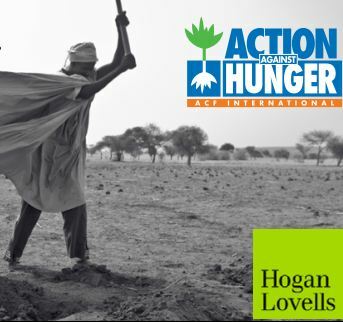 Action Against Hunger and Hogan Lovells are proud to present a series of talks on the role of the private sector in the fight against hunger. How can businesses help end poverty and hunger, achieving Millennium Development Goal 1? How can companies use their resources to partner with existing actors in the field ? Download here the invite and the detailed agenda. You cannot attend? the organizers inform that the interventions will be professionally filmed and later on available on the Internet.